As I was cleaning and folding my clothes this morning, I asked Alexa to play “soft music.” The second song to play was James Taylor’s “You’ve got a Friend” and it took me into a whirlwind of memories that I had that aligned to that song. I thought of some of my best friends who I’d drop anything for, even though they all live in different states. Some of whom I haven’t seen in years, but know that they still love me as much as they did when we’d see each other every day for years. One friend, in particular came to mind. She lived about four blocks away from me and was probably the first friend I had in school, that was more of an acquaintance than anything, in Kindergarten. Weirdly enough, she had a life outside of school, so when it came to the bullying and such, she didn’t know much about that going on. We became super close in high school. We would share dilemmas, would find time to always visit each other and talk on the daily. We’d call each other the other part of each other’s brains, if that makes any sense. We got each other. We shared the same interest in music, went to concerts together, had the same friends. We challenged each other and we could call each other out on things when we saw things going wrong. But she was always encouraging. While going through old letters and notes, (I really was Marie-Kondoing my papers) I found letters from her. I sat and cried as I read them, missing that relationship because it got me through the most traumatic teenage days. When I couldn’t handle friends at school, she would be there waiting for me. When anything would happen, she would have something so uplifting to say. She knew how to love me. At the time, you know teenagers always think they’re crazy and complicated, but she made it so easy. She did my hair for prom, she drove me to church the day AFTER (oy) and she continued to love from afar when we went away to college. As I was going through those letters, I realized that she always felt like she was second. Second to the woman I call my best friend, but she wasn’t. Our relationship was just different. She was on a pedestal all on her own. This connection that I had with another piece of my brain was on the same level. We had each other day in and day out. But I felt like I messed it up. Changes happened. We went to college, different schools, talked semi-regularly, visited each other a few times, were growing with different people and the kicker came when I voyaged across the pond to study abroad. She had written to me a couple of times, but I didn’t keep in touch with anyone at that point back home, besides my parents. She felt like I left her. I’ll never feel like I did enough to salvage the relationship. I came home for the summer and she was celebrating graduation. I got drunk and cried to her, asking why she was treating me so differently than before. That’s when she got visibly upset, telling me that I left her and with that, I didn’t appreciate her. And a part of me does admit that I took her for granted. I know I did. She’s still one of my best friends, even though I don’t see her often and she lives in a different city. We went to each other’s weddings. We tell each other when big things happen. However, there are some things that will never be the same. We’ll never be teenagers again. I’ll never have the chance to lay on her rug, talking things out as she sat at her desk chair like a therapist, running things through with me. We’re both married so all the dilemma around boys are long gone. But all the memories remain. And I’ll love her forever for it all. Previous Why are you friends with them? Next Why did I stay and what did I learn? Aw what a great post. 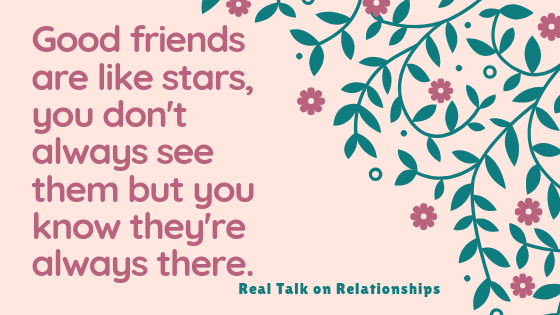 Great friends are so important regardless of the distance between them!